Website visitor Rob H., wrote to request that I post this article featuring the Fokker D.XIII biplane, which was a primary trainer for the air wing of the German army in post-World War I days. 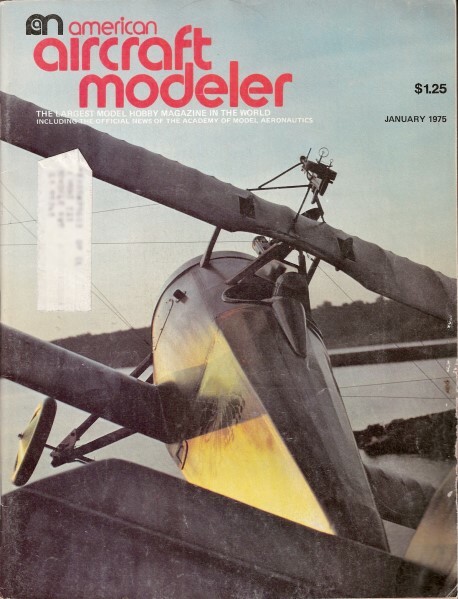 The title might well have been "A Brief History of Tony Fokker's D.XIII Biplane" since the majority of the content focuses on his plane. 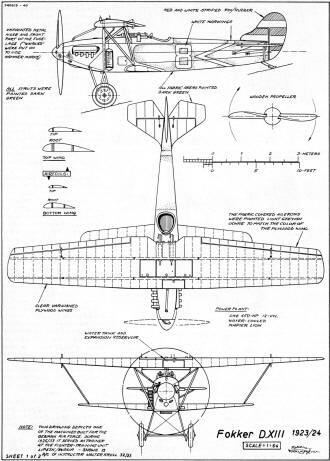 Some really nice 3-views of the Fokker D.XIII are included that show both the covered airframe with markings and the bare framework. It is particularly fitting that this article be requested so close to Armistice Day (November 11, aka Veteran's Day) since the story begins by discussing Germany's defeat at the end of WWI. The reference to 'quiet birdmen' is likely Hitler using the occasion of aiding Russia's air force in order to build its own supply of airplanes and trained airmen in preparation for launching what became World War II as a way to end restriction placed on Germany by the Treaty of Versailles. Armistice Day, 1918, the German Army could march home in good order. The plans of the Central Powers were wrecked, but Germany-proper was virtually unscarred. Once, Germany and its allies had formed a solid geographical unit from the North Sea to Arabia. And, on March 3, 1918, just nine months before the Armistice, the then-victorious German Supreme Command was able to impose a humiliating peace treaty on a defeated and internally stricken Russia. Even though Germany was beset with internal problems of its own, its Eastern Front was secure at last, and veteran divisions could now be thrown into the final drive West. By March 21, the Allies (outnumbered for the first time) were feeling the sledgehammer blows of the German offensive that was begun that day. It would come within inches of succeeding. By then, the balance of power was irreversibly falling the other way. Within Germany, continuing strikes and profiteering had "bought" nothing but economic chaos and political dissension. Progressively eroded by this, the German Army faltered under the weight of its own fatigue, as well as the psychological presence and sheer volume of American troops and money pouring into Europe that spring. In the last 90 days of War, rejuvenated Allied armies drove the Germans back, and the long reign of the House of Hohenzollern began to crumble. Before retreat became a rout, Germany requested an Armistice. On November 11, 1918, the German people entered into a sort of limbo. Until the price of peace could be determined, the game of winners and losers could not end. In the months that followed, while the Allied and associated powers haggled, the German people waited for the other shoe to drop. And with each day's passing, conditions within the "old" empire deteriorated to the point where the man in the street soon considered Germany's current travail as punishment enough. Then, as time went on, he felt, even more, that the War should be, if not forgotten, at least forgiven. But a day of reckoning arrived on May 7, 1919, when the terms of the Versailles Treaty were made public. In its 15 parts, the document included some 440 articles and almost a score of annexes that were destined to touch every facet of German life. Through it, the Allied Powers-especially France - vowed to disarm Germany, crush its military system, grind her fortresses to dust, and impose a crippling sentence that, once and for all, would forever destroy the Teutonic tradition. The Treaty, signed June 28, 1919, was not brought into force until Jan. 10, 1920 - 14 months after the cease-fire. By then, the tap root of German bitterness had taken firm hold. For the time being, it would feed on the underground nutrients of random action. On Armistice Day, 1918, the handwriting was on the wall, and Tony Fokker could read as well as anybody. At 28 years old, he had amassed a fortune in his young life, and his airplanes - Fokker airplanes - were the only ones being singled out as potential targets for sure-and-certain destruction. 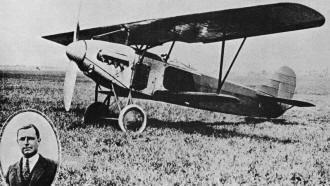 After World War I, Fokker relocated in Holland and continued production of the D/VII. 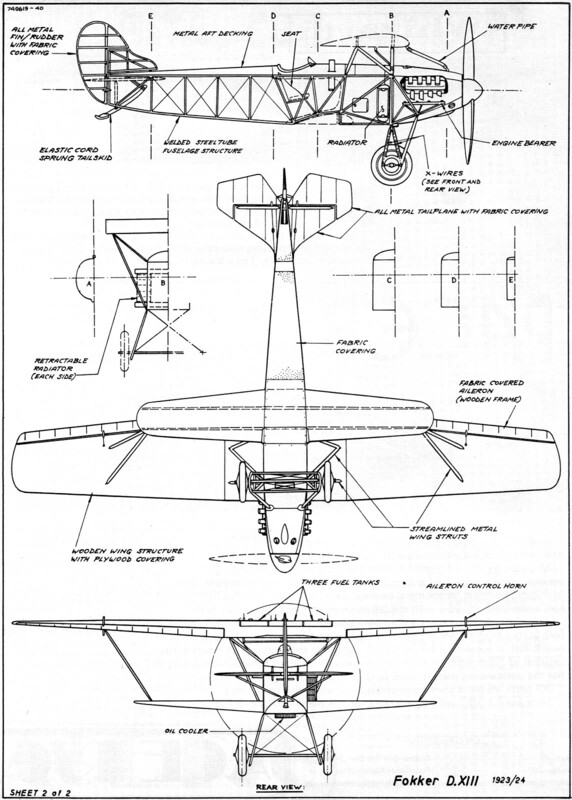 Evolution of the successful design led to the D.XIII in 1924. Photo inset shows Bertus Grase, engineering test pilot for the Dutch-based firm. (Photo courtesy Smithsonian NASM). Although reduced to a 100,000-man corps and restricted to border patrols and maintaining internal law and order, the Army (its Prussian traditions firmly intact) easily blossomed into a state within a state. Under the guiding hand of its chief of staff, Gen. Hans von Seeckt, the cream was skimmed off the top - reducing Germany's army to an elite corps of dedicated professionals, all highly intelligent, talented and resolute. As Gen. von Seeckt affixed his signature to this-the final order to Germany's beloved airmen - he did so under closing words that read: "We shall not abandon the hope of one day seeing the Flying Corps come to life again. The fame of the Flying Corps, engraved in the history of the German armed forces, will never fade. It is not dead; its spirit lives on!" From 1925-33, Germany maintained a training center inside Russia. 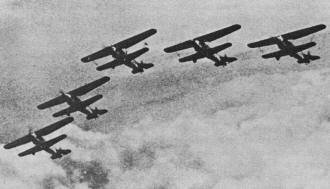 Fokker D.XIIIs were used to train pilots in advanced aerobatics, formation flying, gunnery and air-to-air combat. 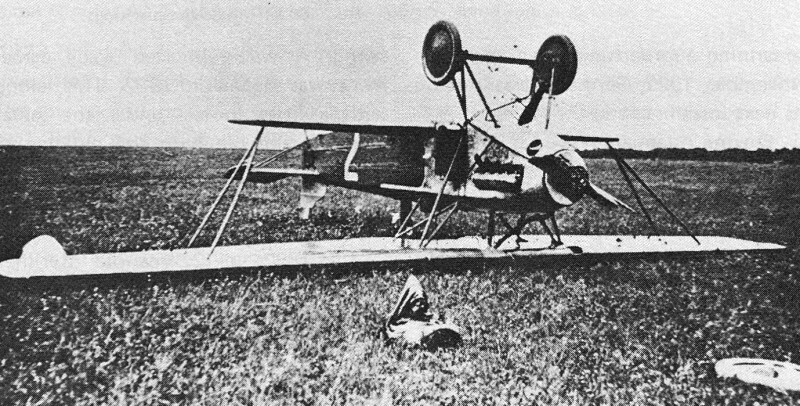 Although Germany wouldn't regain sovereignty over its own airspace until 1923, the ban on aircraft construction was lifted a little in 1922. 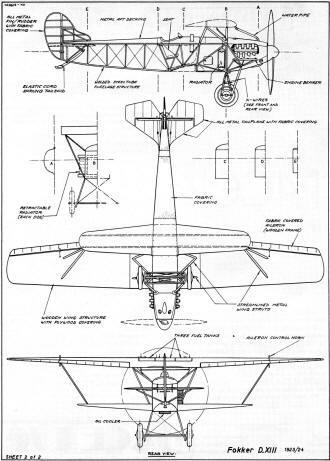 But, with allowable production limited to sports and light aircraft only the likes of Dornier, Junkers and Heinkel opened factories in other countries (where they had a little more freedom to do what they'd already been doing anyway). At the moment of peace, the Allies demanded huge reparations to be paid in the form of cash, raw materials, most-favored-nation treatment, etc. (And there was an immediate mad dash by Germany's high-rollers to invest in foreign securities rather than have surplus funds "repatriated.") The overwhelming flow of capital outside the country only compounded the effects of an unchecked inflation and, aided by a busy government printing press, the German mark began devaluating at something approaching mach speed. In November, 1922, Germany defaulted on its next installment to the Allies. During January, 1923, French, Belgian and Italian troops retaliated by occupying the Ruhr district, heartland of German industry. There wasn't much the Germans could do at the time but spit and throw rocks. Fokker D.XIII in Soviet markings. By now, though, relations between Germany and Russia were on the upswing. A well-publicized trade agreement was signed in 1922. This, along with a little footsie under the table, helped make life with the old hag of Versailles a little more bearable. In 1892, a 22·year-old Berliner named Hugo Stinnes began a coal-dealing business, which he eventually parlayed into the gigantic Siemens-Rhein-Elbe-Schuckert Union. Known as one of the biggest trust-builders of all time, by 1918 Stinnes reportedly had an interest in almost 1,400 businesses, and control over almost one-fifth of Germany's total production. He owned lands, forests, summer resorts, hotels, coal, iron and copper mines, aluminum works, paper mills, newspapers, banks and a whole list of enterprises. Elected to the Reichstag in 1920, his interest in the future of Germany was hardly minimal. 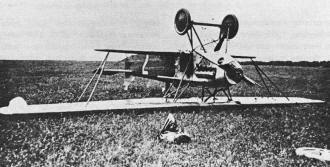 Fokker aircraft were easily repaired, and Lipetsk had the facilities for doing the job. Although the Napier Lion engines had to be returned to England for major overhaul, fancy handling of the paperwork suppressed potential questions. Note the "uniforms." Meanwhile, back in the land of windmills and wooden shoes, everything's coming up roses at the ol' Fokker works. By virtue of its neutral Netherlands locale, Fokker technology is escaping the problems that winners and losers have whenever a war is ended. Continuing on the evolution of the D-series of fighter aircraft, the company developed a sesquiplane design, the 300 hp Hisso-powered D.XI. And in August, 1923, Tony took a sample to the Gothenburg airshow in Sweden. There was considerable interest shown. Within weeks, he was contacted by agents of Stinnes, and the shopping list in hand made it pretty obvious that deep and penetrating questions wouldn't result in any highly illuminating answers. Fokker does a little discreet digging into the source of the order, and not only uncovers acquaintances and associates from the "old" days who are now directing Stinnes' interests, but others (Hello, "hidden reserve"!) with whom he once worked very closely. Although Stinnes' order for the D.XIs was eventually cancelled, the D.XIII order held. 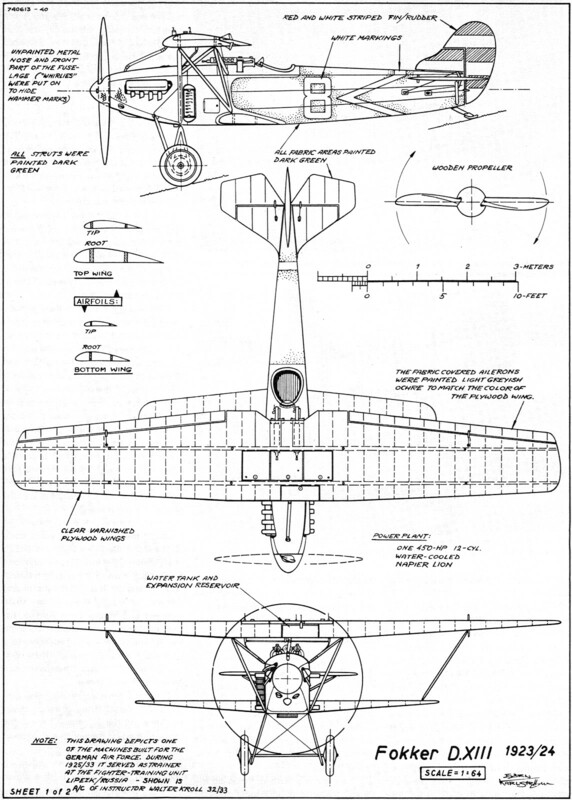 Similar to, but more powerful than the D.XI, the D.XIII was powered by a British 450 hp Napier Lion engine. The compactly designed Lion was a sort of semi-radial having three banks of four cylinders. With a dry weight of just under 850 lb., it developed 450 hp at 2000 rpm. Fitted inside the length (25 ft., 11"). 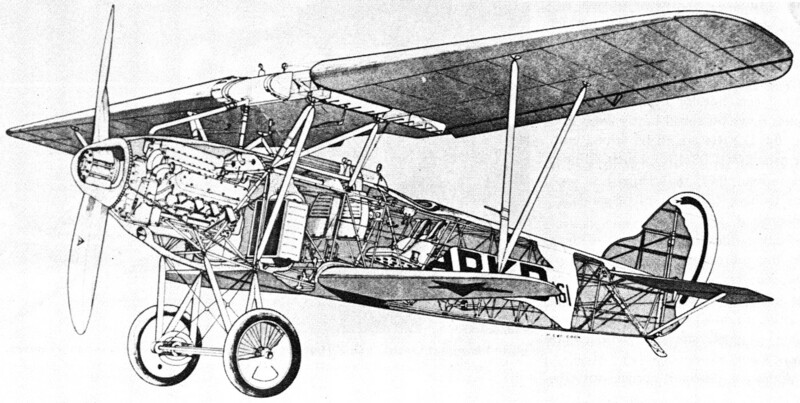 span (36 ft., 1"), and height (9 ft. 6") of the single-seat, biplane fighter, the engine pulled the D.XIII up to 16,500 ft. in 13 min.5 A max speed of 160 mph and exceptional maneuverability made the D.XIII very desirable for the day. When completed, tested and, as per Stinnes' instructions, the D.XIIIs were packed up - the crates all neatly stenciled - and, adios, out the door to South America. But, alas. 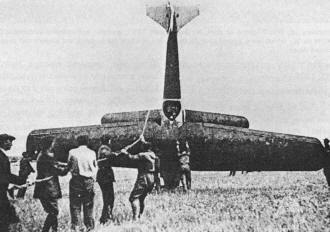 First, it seems some chuckle-headed shipping clerk couldn't read; and from there, things went from bad to worse until, somehow or another, the poor, misguided things got plunked down on a runway about 250 miles south of Moscow, where some equally befuddled pilots just" happened to be standing around. In a hangar at Lipetsk, a D.XIII undergoes repair. The twin LMGs have been removed. Beginning in May, 1921, preliminary and wide-ranging discussions on matters of equal German-Soviet concern had led to the establishment of a mutually beneficial training and experimental center at Lipetsk, Russia.6 Overall details of site selection, facility requirements, mutual operational responsibilities, etc., weren't fully thrashed out until April 15,1925. For, by then, a select group of men was being alerted and the necessary supplies assembled for a clandestine journey deep inside the U.S.S.R. By the evening of May 28, 1925, the Edmund Hugo Stinnes 4, with 50 D.XIII s in the hold, had pulled out of Stettin and was steaming up the Channel towards the Baltic. Bottoms up, No.7 comes to grief. By September, 1933, attrition had reduced serviceable D.XIIIs to 30, which were turned over to the Russians when the training and aircraft test center closed down. On their arrival at Lipetsk in June, the center was declared officially open, and the D.XIII s put to immediate use as trainers. For once - active pilots whose flying and aerobatic muscles hadn't been adequately exercised in years, the D.XIII's 450 horses put quite a strain on the ol' flab. However, there were a couple of DVIIs on hand for them to warm up on. Since the initial pilot-occupants at Lipetsk were scheduled to become the cadre of instructors, most of the first year was concerned with flight refresher courses, creating an updated training syllabus, and a general settling-in. Because the center was a joint endeavor, this included the all-essential shakedown of learning to live and work with those whose approach to life and alien ways were so different, yet whose concern for aeronautics and homeland was just as visceral. 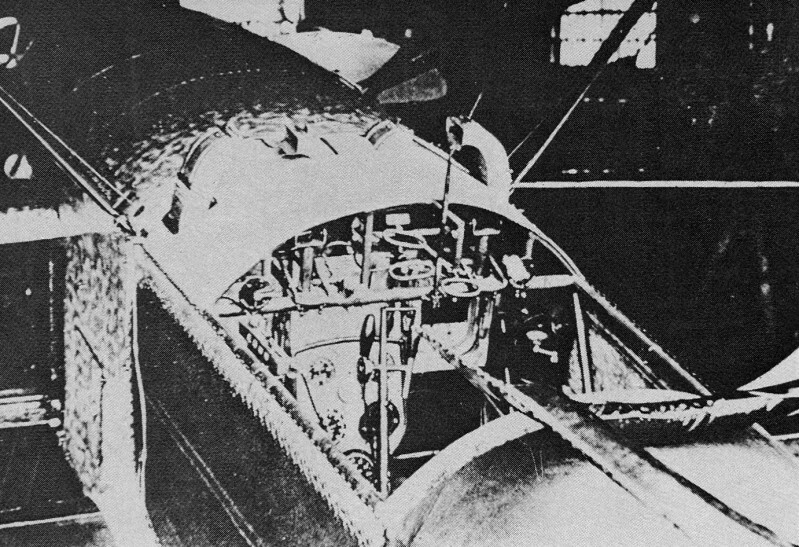 Along with the training school, the experimental aircraft test section was set up, and test and shop procedures were established for an all-encompassing program covering technical and operational testing of military aircraft that were being developed "for the day when ... " Although only by the ones and twos, the aircraft designated to make the trip to Lipetsk also were used as test beds for the latest technical developments in various aircraft components - instruments, ordnance, armament, reconnaissance equipment, gun cameras, clothing - you name it. While series production of new military aircraft was out of the question, it was possible to field test all the equipment from A to Izzard, under all weather conditions so that, at any given time, series production could occur. In 1926, about the time the first class of students were covering their tracks to the east, German international relations entered a period of relaxed tension. The gradual phase-out of foreign troops occupying Germany relieved enough pressure so that sub rosa aircraft development, while no less risky, could be stepped up. With January temperatures at the Lipetsk training and test center averaging about 14°, cold weather operations continued on a lesser scale. Note the absence of national markings. There was a growth in flying clubs - some camouflaged and some through legal renegotiation of the Treaty. It then became possible to provide better, more complete training at home, so that Lipetsk could be used for advanced fighter or (with the D.XIIIs fitted with bombs) fighter-bomber training. With each passing year, then, Lipetsk had to expand its facilities to meet the growth in demand. Even so, at its peak, everything was on an extremely small scale. During the summer months, when the center was busiest, the total population, including Russians, reached no more than about 300. From October on, winter weather reduced the population. Following successful beginnings at Lipetsk, two other centers were opened in the Caucasus: a gas warfare school in 1927; and, in 1930, a tank corps school (Panzer!). On occasion, there were combined exercises between all three and the Red Army. Each spring, no more than perhaps two dozen of the cream of that year's crop of German aviators (military and naval) were selected to take the devious route to Lipetsk. Yet, after the long and tiring journey, any young eagles arriving there probably questioned the value of their selectivity. For, greeting them in their native language was a boldly printed sign proclaiming, "Herzlich Willkommen am Arsch der Welt. "7 Under the circumstances, they became a close and clannish band of brothers whose barracks pranks in the evening relieved the tensions of weeks and months of no-nonsense training. 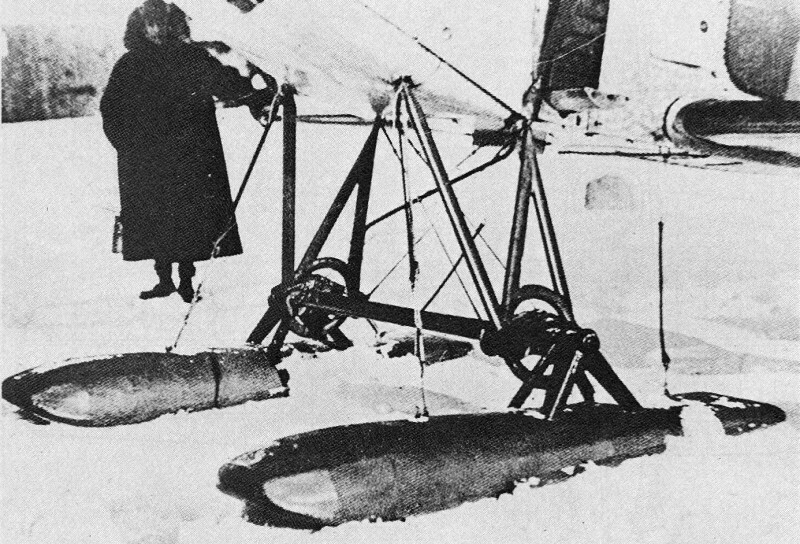 A detail view of the D.XIII's ski attachment. In comparison to World War I instruction methods, Lipetsk was a complete success. Between 1925 and 1933's final class, only three Army and one Navy pilot were killed during training. Still, as few as they were, the deaths brought a heavy gloom to these strangers in a strange land. And so, before the body of their fallen comrade was ignominiously smuggled home in a crate labeled "spare parts," ritual ceremony helped relieve the pain, and united them even more. Shortly after noon on Monday, Jan. 30, 1933, Adolf Hitler marched down the steps of the German Chancellory, aglow in his first moments as chancellor and fuehrer. Lipetsk. Because it was no longer need­ed, it was officially closed in October, 1933. Also, by that January day, con­tingency plans established by the pre­Hitlerian German Army could count on 550 pilots ready for active service. Be­hind them stood a nucleus of ground crew, observers, navigators, bombar­diers, administrators, meteorologists, armorers, shop and maintenance work­ers. And' aircraft manufacturing was about to bu rst its tethers. The pretense is about to end. (1) Walter C. Langsam, Ph.D., The World Since 1914 (New York: The Mac­Millan Co., 1948). (3) Hanfried Schliephake. The Birth of the Luftwaffe (London: Ian Allan. Ltd., 1971). I am also indebted to Mr. Schliephake for correspondence and the photos accompanying this article. the politically "dangerous" from within the ranks. Contrary to its own tradition, the German Army was now deeply pol itical itself. (6) In January, 1921, even as Russia's Red and White Air Forces faced the business ends of one another's gun barrels, the country's internal strife had stabilized to the point where Soviet Leader Lenin ordered a comrnission to begin a 10-year program of national aeronautic development. Both WWI and the Russian Revolution had so denuded the country of the necessary technicians that until native talent could be developed, it had to swallow its pride and rely on outside help-even German. (7) Karl Ries, Die Maulwurfe, 1919-1935 (Germany: Verlag Dieter Hoffman, 1970). (8) Sidney B. Fay, Ph.D. "The Iron Ring Around Germany," The World To­day (Vol. I, No.3), February, 1934.